A few months ago I wrote a post called 10 Topic Choice Mentors, which included ten books I’d come across that might help students find more things they wanted to write about. A few people asked me to create a similar post with nonfiction books. 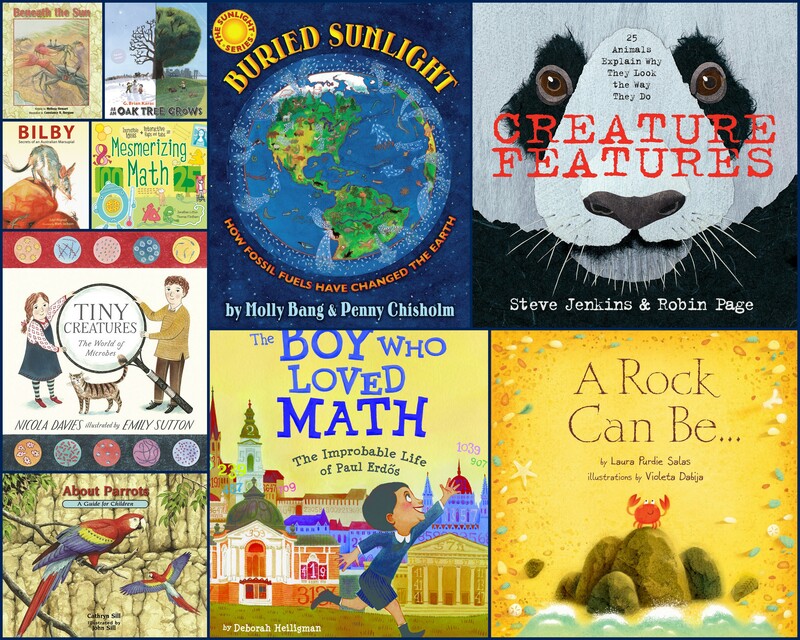 I pushed myself to get out of comfort zone, which is anything historical, to find ten math and science picture books that might inspire students to write. All too often, people who are adept at language arts feel uncomfortable with math and science. And then there are the people who love math and science, but don’t like English and history. Sound like any of your students? Well, perhaps you can turn one or more of your non-writers into a writer by giving them a little inspiration for something they can write about in their writer’s notebook as part of their nightly writing. Publisher’s Summary: Rocks may seem like boring, static objects—until you discover that a rock can spark a fire, glow in the dark, and provide shelters of all shapes and sizes. Laura Purdie Salas’s lyrical rhyming text and Violeta Dabija’s glowing illustrations show how rocks decorate and strengthen the world around them. Use the “More About Rocks” back matter to help you think about a unique way you use rocks in your everyday life. Write about it. Write a poem using one of the pages as inspiration (e.g., book propper, lake skimmer, land connector, sparkling ring). 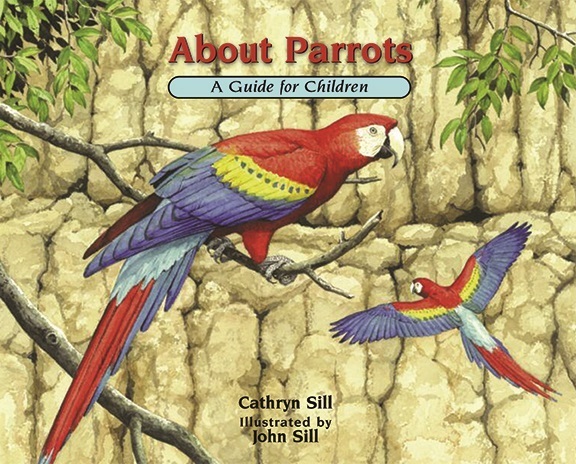 Publisher’s Summary: In this appealing addition to the acclaimed About… series, educator and author Cathryn Sill uses simple, easy-to-understand language to teach children what parrots are, how they look, how they move, what they eat, and where they live. Illustrator John Sill introduces readers to a variety of parrots, from the colorful Blue Lorikeets of the Polynesian Islands to the Rosy-faced Lovebirds of southwestern Africa. An afterword provides details on the parrots featured and inspires readers to learn more. Create an all-about text for an animal you know well. Research an animal and then craft an informational text about how the animal looks, moves, what they eat, and where they live. Use the illustration notes in the afterword to learn more about parrots. Craft a story about parrots using some of the information you learned from About Parrots. Publisher’s Summary: This inventive picture book relays the events of two hundred years from the unique perspective of a magnificent oak tree, showing how much the world can transform from a single vantage point. From 1775 to the present day, this fascinating framing device lets readers watch as human and animal populations shift and the landscape transitions from country to city. Methods of transportation, communication and energy use progress rapidly while other things hardly seem to change at all. This engaging, eye-opening window into history is perfect for budding historians and nature enthusiasts alike, and the time-lapse quality of the detail-packed illustrations will draw readers in as they pore over each spread to spot the changes that come with each new era. A fact-filled poster is included to add to the fun. Find something in your neighborhood that’s been around longer than you. Write its story. Imagine what life was like for children living in your neighborhood 20, 50, 100, or 150 years ago. Think specifically about how the place looked physically different and write about life during those times. Write about the life cycle of an oak tree from the tree’s perspective. Publisher’s Summary: When the sun is shining brightly, people put on sunscreen or scurry inside to cool off. But how do wild animals react to the sizzling heat? Journey from your neighborhood to a field where an earthworm loops its long body into a ball underground, to a desert where a jackrabbit loses heat through its oversized ears, to a wetland where a siren salamander burrows into the mud to stay cool, and to a seashore where a sea star hides in the shade of a seaweed mat. In simple yet informative language, Beneath the Sun shows young readers how the animals who live there survive the hottest time of the year. Write about the most challenging time of year for you to be outside. Why is being alive during a particular season or month hard for you? Research an animal’s habitat and write about how it lives. Take something new that was learned from Beneath the Sun and write an entry about the way the animal lives in its habitat. Publisher’s Summary: In the hostile Australian desert, a mother bilby gives birth to a baby. Nestled in a burrow deep underground, she cares for her little one. Soon he must grow up and learn to survive in a harsh environment. Nature-loving readers can follow the story of this elusive marsupial, learning its secrets even as it burrows out of sight. Think about a unique animal you know a lot about and share its secrets in writing. Craft a hybrid text, like Bilby, that includes a story and facts. Write about another baby animal’s first weeks on Earth. Publisher’s Summary: What are fossil fuels, and how did they come to exist? 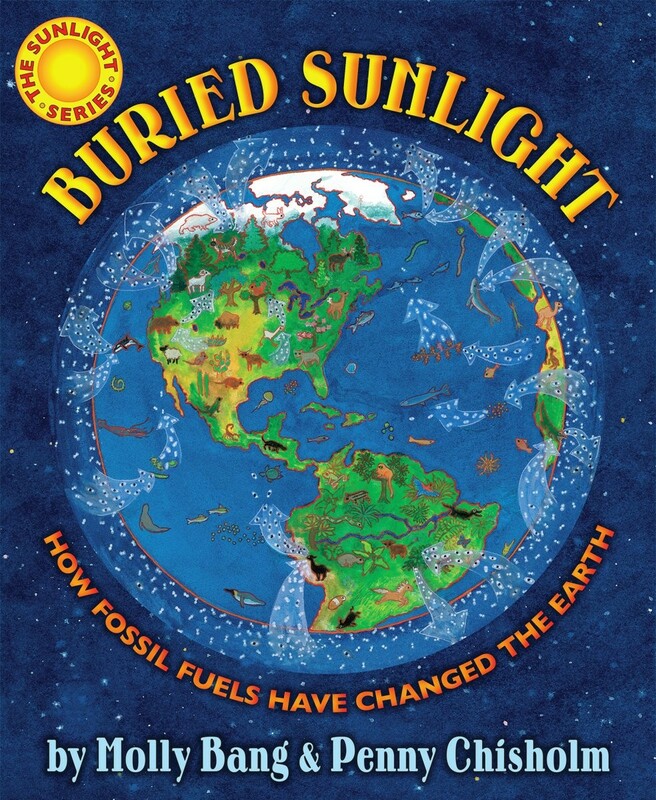 This engaging, stunning book explains how coal, oil, and gas are really “buried sunlight,” trapped beneath the surface of our planet for millions and millions of years. Now, in a very short time, we are digging them up and burning them, changing the carbon balance of our planet’s air and water. What does this mean, and what should we do about it? Using simple language and breathtaking paintings, Bang and Chisholm present a clear, concise explanation of the fossil-fuel energy cycle that began with the sun and now runs most of our transportation and energy use in our world. Use the back matter to learn more about fossil fuels. Craft a persuasive piece of writing (i.e., letter, essay, op-ed) that will convince people to use energy more efficiently. Create a question and answer text where you pose important questions directly to a reader and answer them. Write about the way planet Earth will look and feel in the future if humans continue on the same path. Publisher’s Summary: Let’s face it. Even as babies, we humans pay close attention to faces. Observing another person’s features and expressions tells us whether they are happy, angry, excited, or sad. And when we look at an animal, it’s hard not to imagine that its face is communicating human feelings. This isn’t true, of course. Squinty eyes, an upturned mouth, or another odd expression is probably there because, in some way, it helps that animal survive. Create a series of question and answer entries (i.e., pose a question and answers it from the perspective of the respondent). Use the information about one of the animals (provided within the body and in the back matter of Creature Features) to create a realistic story about that animal. Research an animal of interest, taking notes along the way. Create informational writing about that animal. Publisher’s Summary: An interactive, engaging and exciting exploration of math, from the invention of zero to the geometry of a donut! Clear, humorous text, bright illustrations, and interactive novelties help explain such topics as numbers, geometry, probability, transformations, and statistics. The focus is on making math accessible and exciting, so each topic has an investigation for young numbersmiths to try at home. 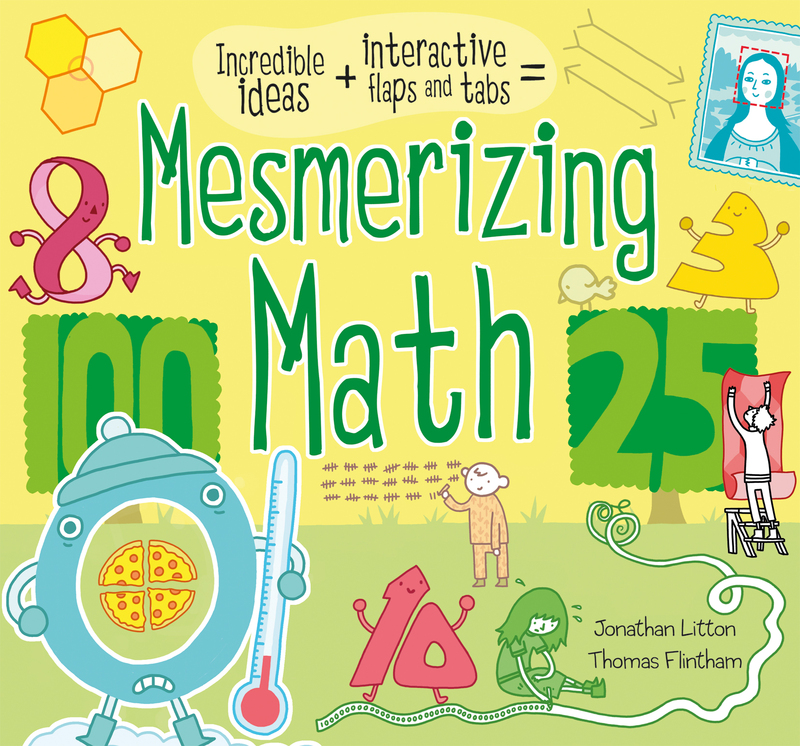 Craft some mathematical stories based upon something new you learned Mesmerizing Math. Write about a “eureka moment” you had about something mathematical. Publisher’s Summary: Most people think of mathematicians as solitary, working away in isolation. And, it’s true, many of them do. But Paul Erdos never followed the usual path. At the age of four, he could ask you when you were born and then calculate the number of seconds you had been alive in his head. But he didn’t learn to butter his own bread until he turned twenty. Instead, he traveled around the world, from one mathematician to the next, collaborating on an astonishing number of publications. With a simple, lyrical text and richly layered illustrations, this is a beautiful introduction to the world of math and a fascinating look at the unique character traits that made “Uncle Paul” a great man. Compose some writing about what makes you unique or misunderstood by some people. Let one of the illustrations or mathematical formulas (in one of the pictures) inspire some writing. Write about ways you can share your knowledge with other people like Paul Erdos shared his brain with friends worldwide. Publisher’s Summary: All around the world — in the sea, in the soil, in the air, and in your body — there are living things so tiny that millions could fit on an ant’s antenna. They’re busy doing all sorts of things, from giving you a cold and making yogurt to eroding mountains and helping to make the air we breathe. If you could see them with your eye, you’d find that they all look different, and that they’re really good at changing things into something else and at making many more microbes like themselves! 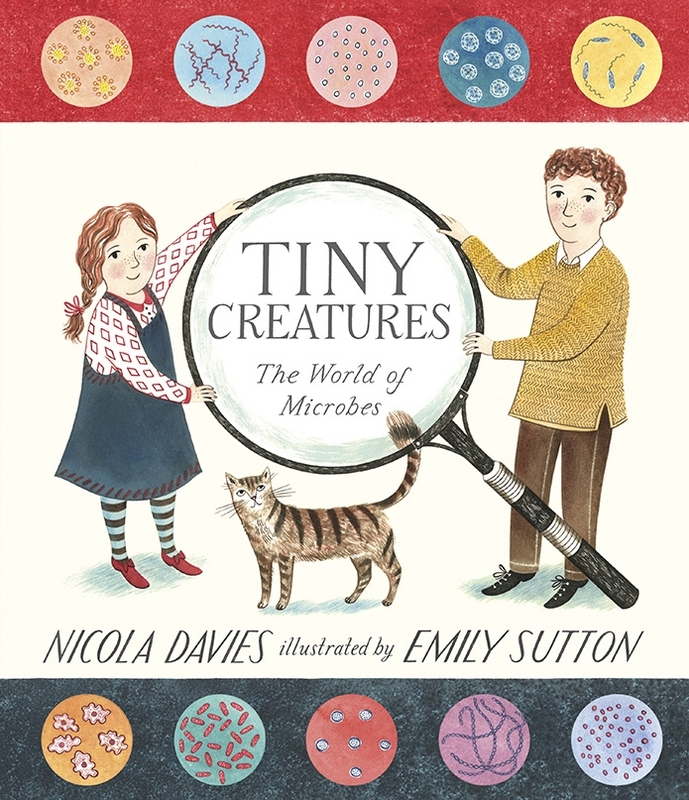 From Nicola Davies comes a first exploration for young readers of the world’s tiniest living organisms. Teach someone about a hard-to-understand concept by writing in a way that makes the information accessible (just like Davies did). Pretend you’re a germ that’s infecting someone’s body. Write about how you’d make the person sick. Write about something small that can have a big impact. Try reading one or more of these books and allow them to inspire your own writing. Once you have a piece of writing inspired by any or all of these books, you will have a tangible example of how you let a book inspire you to write. When I got the idea for this post, I anticipated having an even split between math and science. As you’ve seen, my list is just 20% math and that’s only because I was willing to go back a couple of years in terms of publication dates. (All of the science texts, above, were published in 2014 or will be published this year.) While you can do an Amazon or Pinterest search for more math-related titles, may I suggest checking out “What Makes a Good Math Storybook?” by Audrey M. Quinlan. Her article is featured in the January/February 2015 issue of The Horn Book Magazine and includes also includes a book list on page 56. Also check out Betsy’s post where she reviewed the book IF… A Mind-Bending Way of Looking at Big Ideas and Numbers by Smith and Adams. Finally, if you’re looking for a fantastic app to inspire some mathematical students, check out Incredible Numbers, which is one of the 2014 Cybils Book App Finalists. Several publishing houses are giving away one copy of each book listed above. Many thanks to Candlewick Press, Houghton Mifflin Harcourt, Macmillan, Millbrook Press, Peachtree, Penguin, Scholastic for donating a copy for TWT readers. For a chance to win this copy of one of the titles above, please leave a comment about this post by Wednesday, January 28th at 11:59 p.m. EST. I’ll use a random number generator to pick the winners, whose names I will announce at the bottom of this post, by Friday, January 30th. If you are the winner of the book, I will email you with the subject line of TWO WRITING TEACHERS – MATH AND SCIENCE MENTOR TEXTS. Please respond to my e-mail with your mailing address within five days of receipt. Unfortunately, a new winner will be chosen if a response isn’t received within five days of the giveaway announcement. 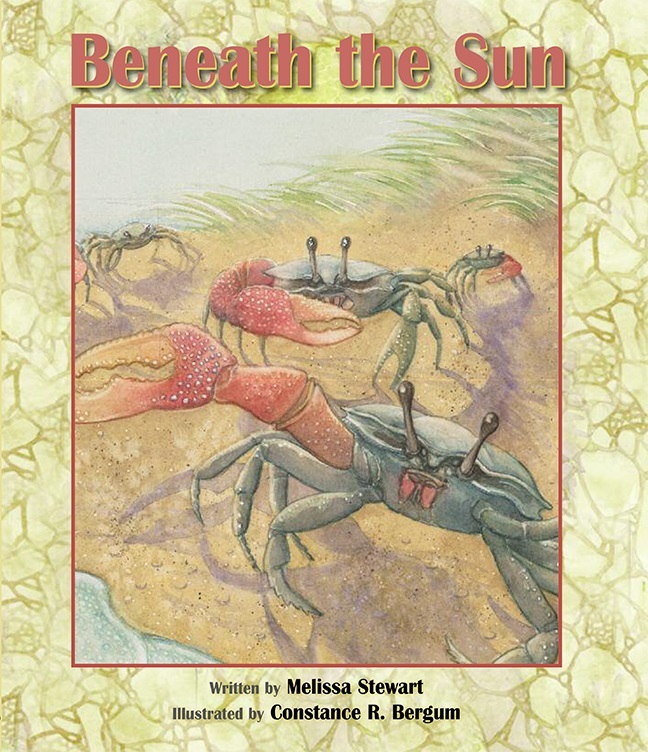 Beneath the Sun — Missy D.
Thank you for more ideas for using mentor texts in the classroom. I look forward to reading and using your suggestions. I have made more of an effort to share nonfiction picture books with my 4th graders and am amazed how engaged they are. They LOVED Creature Features and even explored some of their own curiosities about strange animal features through further research. I absolutely love your blog! I found it when I was at the TCRWP last summer! These are amazing and suggestions that I can’t pick just one! Any will do! My boy writers love to write non-fiction books! I always love adding new texts to my mentor text collection. Thanks for this! I was so happy to meet Laura Purdie Salas at NCTE and get a signed copy of A Rock Can Be… I’ve had my eye on a few of these books, but I never seem to get around to nonfiction. Here’s to changing that in 2015! i would be excited to add any of the titles to my library! Thank you! I’d gladly love any of the books mentioned. I love all of the ideas and look forward to trying them out with my 2nd graders! Thanks for posting this and thanks for the chance to win! such great ideas…I love a book that can cover several things and be referred to throughout the day. Great ideas and great books! About Parrots and Tiny Creatures both look very promising! Great list of books! I would love A Rock Can Be… I’ve used the others like this for writing in primary classrooms. An Oak Tree Grows would be great title too. I love that is shows the progression. What a great give away with so many useful suggestions. I teach high school biology and am always looking for ways to use picture books to engage my freshmen! I’d love to share Buried Sunshine when we have our ecology unit later this semester. Whet a great list of new, non fiction titles! I’m excited to read a more non fiction texts to my first graders. Thank you for the inspiration. Thanks for posting about such interesting and helpful books. These look great — thanks Stacey & Co.
Another favorites is: 1 + 1 = 5 AND OTHER UNLIKELY ADDITIONS (by David La Rochelle, Sterling, 2010. It is quite funny. Also, a question — what with PI Day being a special one this year (3/14/15): has anyone seen any good PI titles that they would recommend? This is a wonderful post with some great books! I go to the library each year and check out a few of these, but do not own my own copies! I know my students would love to read any of these titles!! Thank you so much. Mentor texts are so important and I absolutely agree with your double duty comment! I appreciate your help! I just discovered Two Writing Teachers…..so wonderful! This is an exciting book list. I am especially inspired by Mesmerizing Math, Creature Features and A Rock Can Be. Now off to devour the rest of your site! Glad you found us! Shoot us an e-mail if you have any questions. It is always so very helpful to have more ideas on how to use mentor text to support writing. Thank you for the multitude of ideas for these texts. I would love to use these and share them with other teachers in my school. I would love a copy of Creature Features, A Rock Can Be, and Beneath the Sun! We are going to be entering our expository unit in 4th quarter, and these books would really help out my kiddos with their writing, and they’ll help spark some interest into researching about these topics! Great ideas, it is often difficult to get students to write. I can’t wait to use these ideas in my classroom! They are all great! As the Oak Tree Grows and Beneath the Sun both go perfectly with some of my science units. My son loves math! These would be great! These are great! I find it impossible to keep up with all the best new books out there. Thank you for your great lists! Super list of books that would enhance teaching and provide a burst of energy when kids are in the winter doldrums. Would love any one of the titles in the list. Love the ideas. I teach 4-5-6 grades in Science, so any of the Science books would fit at least one of the grades. Thanks for your hard work. This is an excellent list of resources and ideas. Thank you! Every one of these books is new to me! Yikes! Perhaps I am focusing far too much on fiction? They sound so good! I will definitely be checking these out…especially interested in A Rock Can Be and As An Oak Tree Grows…. Thank you for sharing these wonderful books and ideas! Will be sharing with my colleagues. These books all look great. I would love a copy of “A Rock Can Be”. We study Rick and minerals in grade 3 and it would be a great to link Language Arts (writing) and science. What a wonderful selection! Any would be wonderful to win, but my favorite would be An Oak Tree Grows. Wow! I love Steve Jenkins’ work. Creature Features sounds great! This is fantastic! I need to bookmark this and come back to it later. Lots of great writing prompts here. These all look really cute though I think The Boy Who Loved Math looks so adorable. Thank you so much for taking the time to do the research on great mentor texts. They all look so interesting!! Any of the books would be helpful. My teachers are really struggling with writers workshop and can use all the support available. I would Love to win one of these to share with the teachers in my school…keep these coming!!! Thank you so much for this great list of books for my MANY science/math strong but I don’t know what to write about students. I will find TIny Creatures locally and get into one student’ hands as soon as I can. I want to acknowledge the incredibly thoughtful addition of so many ways to use these mentor texts. Sometimes I see books and know they are terrific, but don’t know how to make full use of them. I am grateful. I have loved using The Boy Who Loved Math. It has so many layers and is rich with possibilities! Thanks for introducing me to a couple of “new” books! Creature features would be my top pick! I would also like the Tiny Creatures . I have a few students obsessed with the microscope and microscopic life. Love reAding about these titles you selected and thinking how they could be used…I’m a lover of Children’s Literature so if my name is drawn, any title won is a bonus! Thanks for all the great resources you’ve shared. Thank you for the list of treasures! I love the “What’s Next for Writers”! Great books ! A Rock Can Be would be perfect for our unit on rocks! Also any of the animal books would be great for our study of habitats . Molly Bang has a few awesome books about energy. My Light & Ocean Sunlight are two that 4th & 5th grade teachers use at my school to pair content & literacy. She is an amazing author. Thank you for this list. All the other recommendations are new to me and look great! I would love a copy of Buried Sunlight. I teach grade two science Hot and Cold Temperature. I am always searching for new ways to help students understand the types of energy we use to heat our homes and ways we can become more energy efficient. This book looks perfect! Reblogged this on Great Mentor Texts. I love this essay on using nonfiction books in the classroom. As a teacher and a writer, this is so helpful. We are studying animal features and writing about them in class now. I love these resources! I am particularly excited to try out Mesmerizing Math in my classroom! Thanks for the post! 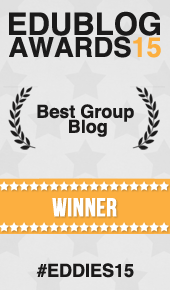 Thank you so much–what a terrific giveaway! I love them all! Thank you for the wonderful recommendations and suggestions on how to use them to encourage more writing! It is through reading that you learn to write. Love, love, love Steve Jenkins! I teach pre-service elementary teachers and “Creature Features: 25 Animals Explain Why They Look the Way They Do” would be a wonderful addition to our discussions of disciplinary literacy! My class loves books by Steve Jenkins! We use them for science and as models for writing! I love the books listed. I particularly like that you have left writing ideas to accompany them! As an Oak Tree Grows would add to what I do with plants. Our class visits a local historical park where the Battle of Tippecanoe was fought so many hundreds of years ago. We talk about the age of the trees standing. This book would bring home the “if these trees could talk” about what they have seen. It would add to the launch of our local history. However, all of the books sure sound appealing! Love, love, love all of these books! 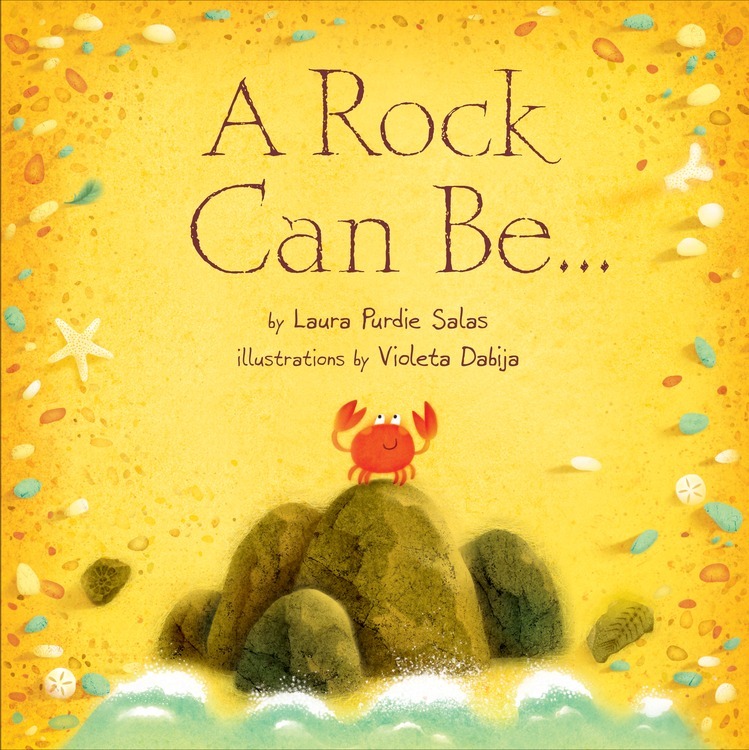 A Rock Can Be… Looks like a great book for teaching growth mindset! i would love any of the books but the one with fossil fuels would be great to integrate into my fourth grade standards. Tiny Creatures:The world of microbes sounds a wonderful book to use as a mentor text when teaching content vocabulary and science concepts like immunology. Can’t wait to see if I get lucky. This is a fabulous list of mentor texts! Thank you. Loved this post, Stacey. I’m always on the lookout for great nonfiction books. (Who am I kidding? I’m always on the lookout for great books of any kind!) And you are so right: we are always pressed for time in our classrooms, so finding books that do at least double-duty is always a plus! I know 4 of these titles so am glad to add more to my TBR list. If I were lucky enough to win, I’d be happy with any of the books. I do already have The Boy Who Loved Math. Thanks for a great post and for the giveaway! Thanks for sharing this list! Its more important than ever to get the most bang for your book! My students would love a copy of “Mesmerizing Math!” I just had them collaboratively write a book on “Fractions, Decimals, & Percents” instead of taking the end of Unit test on that topic! Glad to know I am on the same page as you two! We did a workshop at the beginning of the year on “double dipping” mentor texts with science and social studies, as well as Writers Workshop. I used Creature Features this week in my third grade classroom as my read aloud in readers workshop – such voice!! We revisited the text in writers workshop when it came to students selecting possible research topics! 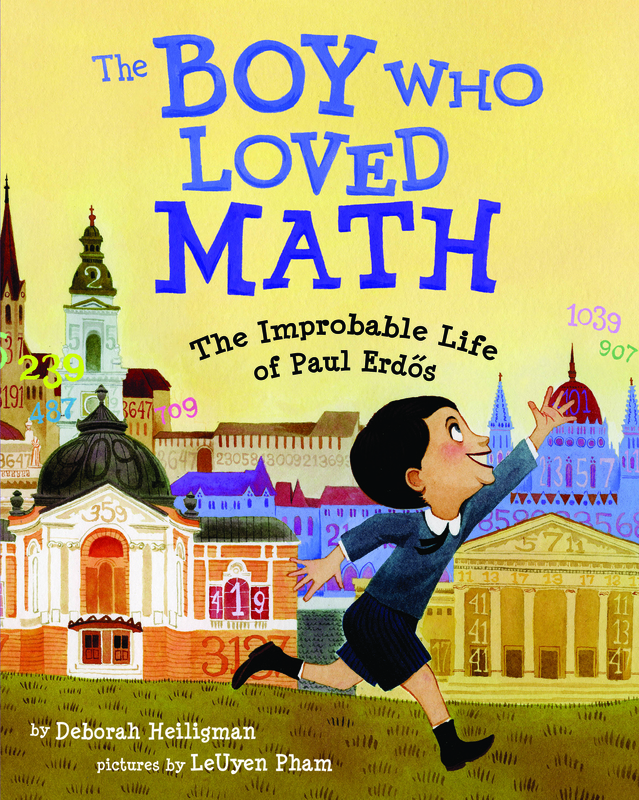 I’d love to win any book but especially The Boy Eho Loved Math. I teach students with special needs who often have very strong preferred interests. They will be very advanced in their subject interest but lack other age typical skills. Seeing themselves presented positively in a book would be very empowering. Thank you for these great books to add to my mentor texts. What a most wonderful and resourceful post! I truly look forward to seeing if our school library has these books to use in my classroom. Thank you for sharing and I can’t wait to use some of your ideas in my classroom. Thank you for the resources, I’ll have to see which ones will work for high school low readers/interesting without making them feel too young. Thanks for your post! I am a bit of an anomaly, I guess, because I teach both language arts and science to 5th and 6th grade middle schoolers. Though we don’t read a lot of picture books together, it is great to toss one or two into our units. Tiny Creatures and A Rock Can Be appeal to my biology and geology interests. What a great list of Mentor Texts in Math and Science. So many uses for these! Thank you! Wow! Thank you for such a great compilation of nonfiction mentor texts! Two of my favorite NF authors are there with books I did not yet know about it. (Steve Jenkins and Nicola Davies) I definitely will get them, plus the Buried Sunlight book! 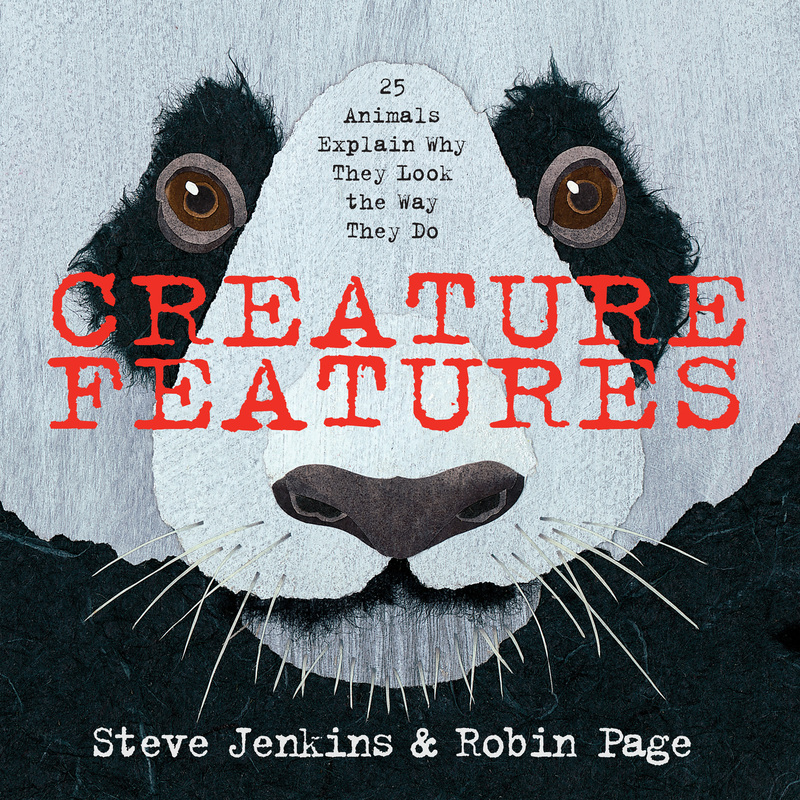 We used Creature Features by Steve Jenkins and Robin Page today in a professional development session for First grade teachers who are about to launch an informational writing unit. We plan to use it as a mentor text. We loved the question-answer format and think that our first grade writers will love it, too. Wow! Thank you so much for the wealth of resources and ideas for Math and writing. I can wait to see A Rock Can Be – I have Water Can Be. I love your posts and would love a chance to win any of the books! I share “The Boy Who Loved Math” with my grade four math class and it has inspired us to learn about more mathematicians such as Fibonacci and Euler. Thanks, great post! Would love to win any of these great books! I’m looking for mentor texts that go with the choice units in Teachers’ College’s If…Then books. It sounds like “About Parrots” is a great one for the K “Writing All About Books” unit. Also, “Creature Features” sounds fascinating! Thank you for the new ideas! I look forward to exploring them all, especially Steve Jenkins’s Creature Features. His other books, including Actual Size & Biggest, Strongest, Fastest have been student favorites for years. If you like Steve Jenkins, you should check out Clare and Tammy’s most recent post, http://assessmentinperspective.com/?p=2268. It’s all about his books. You never fail to introduce books that are rich in content and catch a reader’s attention! I love using a great book for many purposes. Not only is it like killing two birds with one stone, but it gives students an opportunity to fall in love with a book multiple times! Super titles. Can’t wait to try out the resources in my classroom! I agree that we need to use books in the classroom that serve “double- or triple-duty” to help save time and energy. I love using picture books in the middle school ELA classroom; they raise the engagement level for students! What a great list of Math and Science mentor books…something we certainly do not have enough of. Thank you, not only for the titles, but for listing a few optional ways to use them in with our students. This is extremely helpful for both me and my students! I love to include a good book with each math lesson. Thanks for the new idea. Thanks for so many great titles for informational books. Our class will be studying Australia as part of our Small World unit. 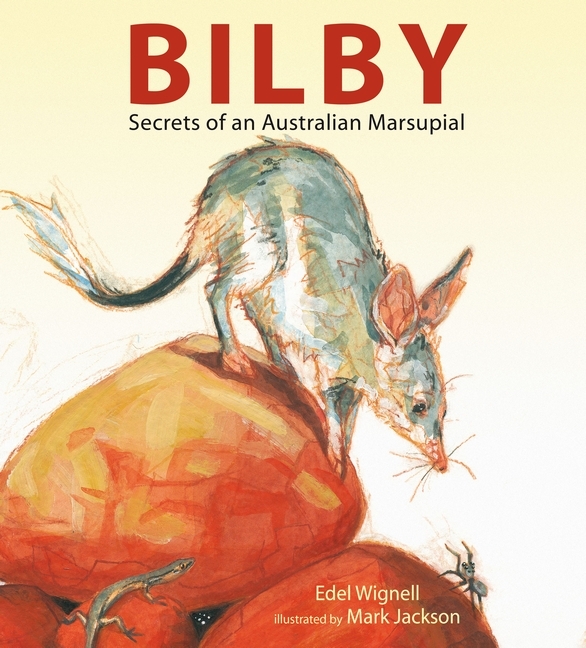 I think Bilby… Secrets of an Australian Marsupial would be perfect for my class. The lessons sound appropriate for many grade levels/ many readers. Thanks again. Here are some great books and cool ways to use them in the classroom. Thanks for sharing the book titles AND ways to use them I really find that helpful. The Boy Who Loved Math would be a great addition to our biography unit, as well as being a great Math book. I’ve been in love with Steve Jenkins books for awhile now. My students love his unique way of looking at animals. My mind is thinking of so many possibilities to inspire my writers. I’m thinking of the book “Beneath the Sun”… ohh the possibilities, “Withstanding the Wind” (that’s a perfect one if you live in Wyoming!) Thanks for this post! Mesmerizing Math looks awesome! I have some students who love math. I bet they would love that and The Boy Who Loved Math! I”m struggling with my writing program this year and this is just what I need!. I wish there was a magic button so I could order them all right now! (And I wonder why I’m always broke…) thank you -truly- for all the great posts. These would be great to have for my students AND my daughter! Thanks for adding to my TBR pile and my mentor text pile! Looking forward to checking them out! WOW! This list is amazing and extremely helpful for engaging students in literacy and math! Great list to promote the STEM fields! Wow! So many ways to use these amazing books. Win or not, I’m going to find a way to use some of these books into my reading and writing workshop. Thanks for sharing! Thanks so much for sharing these ideas and resources! Thank you for compiling this great list!!! As far as potential, I think A Rock Can Be takes the cake! So many ideas spring forth from this book for student (and teacher) writers. Another must-have for my classroom library — and, perhaps, the kick-off for another Mock Newbery experience in 2015! Many students prefer nonfiction for their independent reading, so it is always good to learn about new titles — and to be reminded about old ones! As part of a Mock Caldecott experience, my fourth graders read and reviewed many 2014 picture books this fall. One of those was Creature Features by Steve Jenkins. In true Jenkins style, the book reached out and pulled the students into the book through fascinating information and illustrations that both supported and extended that information. This is another of his “must-haves” for your own classroom collection and I would love to own a copy myself! Oh my! I can’t wait to use Tiny Creatures in my classroom! Thanks for the giveaway! Wow Stacey- what an interesting list. I am not familiar with many on this list, and am excited to explore them. I’s especially interested in How an Oak Tree Grows- seems like it has a thousand possibilities. Thanks for sharing! Great list of books and writing tips! Thank you for gathering together this resource. Several titles I hadn’t seen before and will now be adding to my wish list. I was especially excited to see Mesmerizing Math, I’m always on the lookout for another math title to add to my collection. Wowzers! As a 4th grade science teacher, this is such a meaningful post for me! A Rock Can Be looks perfect for our unit on Geology as well as Creature Features for our animal research. Thank you for the wonderful ideas! Great list! i am forwarding this to my librarian and math/science specialist! These are awesome books that will spark interest in so many topics. The world of nonfiction publishing has changed so much. Thanks for highlighting such great titles. What an open treasure box of texts! I told myself this year I would use more picture books, and yet, I have gone back to my old ways. I have downloaded A Rock can Be so I will start there with these great activity ideas. Thanks! Love to see all of the beautiful books that support math and science. Thank you for sharing. I enjoy these posts to learn about the latest informational picture books. They’re such a great way to introduce or enhance a topic. So many of these books allow for students to see how science, writing, math, history can all be combined together. The ideas you listed are great! It’s easier than you think to link these science books to math…mostly by adding on to their relevance to the world. Thanks for the Next for Writers tips! Thank you for the treasure trove of ideas for the texts. I would love to use these. So many great books for informational. A Rock Can Be is a great book to incorporate in my rock unit. I love that you included suggestions on the lessons for each book. Thanks for sharing! I would love use these ideas in my class.